Small Town Spin by LynDee Walker, a Mysterious Review. Review: Richmond Telegraph crime reporter Nichelle Clark is asked by a mutual friend to be the first to interview retired football legend Tony Okerson and his wife following the suicide of their son, Tony Jr, known to his family and friends as "TJ". She's known to handle situations like these sensitively, and the fear is once the national news hear of Okerson's son's death it will be a media circus. 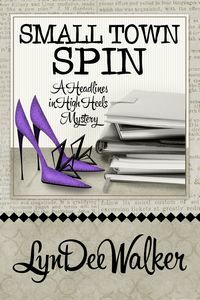 But once Nichelle arrives on the scene, she realizes there is more, far more, to this story … in Small Town Spin, the third mystery in this series by LynDee Walker. TJ was killed by a combination of prescription drugs and alcohol. At least that's what the local police chief is assuming based on what was found at the scene. But everything Nichelle heard from his parents suggested he wasn't in the least suicidal. Sure, his girlfriend was spending a semester studying in Europe studying and he had recently hurt his knee playing baseball, but neither of these would seem to be so important that he'd want to take his life. Maybe it was simply an accident? When TJ's girlfriend Sydney returns for the funeral, and is later found dead, also of a suicide, Nichelle is more suspicious than ever. It is too much of a coincidence that two students from the same school, both with promising lives ahead of them, could be dead within a week of each other. This series of mysteries is subtitled "Headlines in High Heels", which may suggest a breezy, "chick-lit"-style storyline, but that certainly isn't the case here. Small Town Spin has at its core a solidly-crafted murder investigation. Nichelle is an engaging sleuth, who uses her professional contacts and resources to cut through the screen that the local police have put around the case — hence this mystery's most appropriate title. The whodunit element is handled very well here: the suspects are credibly drawn even as their potential motives for killing a high school sports star are hard for Nichelle to pin down. Indeed, Nichelle rejects them all on their merits (or lack thereof), which spurs her to dig deeper. The resolution isn't quite as original as it could have been, but the scene in which it plays out is quite tense and suspenseful. This is a very good entry in this series, one that will please existing fans and will no doubt have new readers seeking out the earlier books. Acknowledgment: Henery Press provided an eARC of Small Town Spin for this review.